During the mid 1950s, towards the end of a ten year period in Europe, Tucker's interest in Australian subject matter was rekindled by seeing fellow artist Sidney Nolan's recent work. In 1954 the two artists held a joint exhibition at the Foreign Press Club in Rome, where Nolan's carcase paintings made a deep impression, as did the black and white photographs he showed Tucker of the drought in Australia. 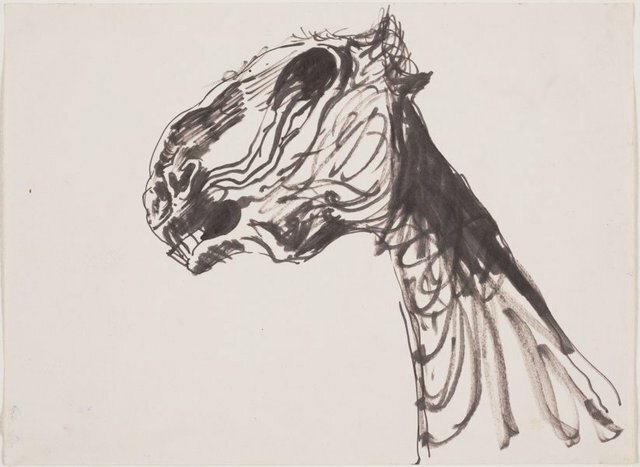 Inspired by those images, Tucker created a series of drawings including this one – as part of his working process toward making paintings, including the extraordinary 'Apocalyptic horse' 1956.